The average American household receives more than 700 pieces of direct mail per year in the form of catalogs, fliers and other marketing materials, according to the United States Postal Service 2010 Household Diary survey. Want to cut down on that number? PaperKarma, a free app for iOS, Android and Windows Phone devices, makes it as easy as taking a photo. When you load the app on your smartphone, you'll need to sign up for a PaperKarma account with your name, address and phone number. 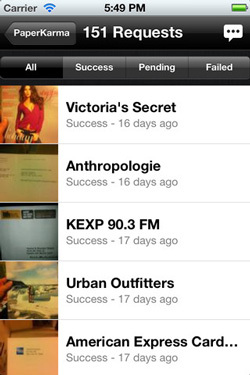 Then you can start snapping pictures of your unwanted mail, the app will do the rest. PaperKarma contacts the sender with a non-solicitation request to have your address removed from their distribution list. You'll get a notification that you're unsubscribed within a couple of days, but PaperKarma warns that the mailings may not stop for several weeks. This method isn't 100% effective, since some mailing are sent by zip code, but it's a great tool to have in your disposal. You can keep track of your requests within the app.PaperKarma will also check periodically to make sure you are still unsubscribed from the mailing list. I just started using Paper Karma to try to get rid of the junk mail we get at our weekend house. I understand the Post Office needs money and would even be willing to pay to stop the needless waste of paper etc for stuff that goes straight into the garbage. Even suspending delivery just gave us two month old circulars. So far it’s too soon to tell how effective it will be, but PK says they’ve gotten rid of one supermarket circular. Keeping my fingers crossed and hoping for the best! How about a follow-up piece in a month or two? Think of so-called “junk mail” as the reason it doesn’t cost $5 to mail your aunt a birthday card!And what’s the big deal, anyway? We all recycle, or should-it takes me 10 seconds to grab the things I’m not interested in (and I’ve found lots that I am interested in, by the way) and drop it in the recycling bin. This is a high tech solution to a low tech problem. The big deal is all the trees wasted along with fuel burned needlessly. It is a huge deal which will cause much suffering for future generations because we wasted so much in such a short time. Think about your grandchildren and stop waste.